In Gran Canaria, there can be quite a big problem with dry wood termites, or Carcoma as the plague is commonly called here. You have surely seen wooden surfaces covered with hundreds of small holes as you can see on the featured image above. That is the work of that nasty plague. 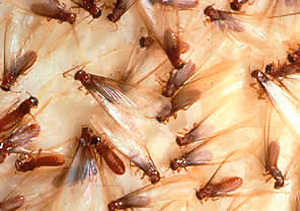 Dry-wood termites can only survive in a warm climate and are therefore different from damp-wood termites. Any wooden construction can be affected, especially if it has not been treated against termites before. Every June and December a swarm of these termites hatches, flying out in all directions, looking for new and untreated wood to start a new population. The insects look like flying ants of a reddish brown colour. Without wings they look more like brown worms with a separate head. When they hatch they fly towards the light. As soon as they land on a hard surface, they bite into it and drop their wings. Sometimes these nasty beasts live in wooden furniture or, even worse, in the hidden wooden frames which hold up the false ceilings. We have heard of cases where the whole false ceiling came crashing down. 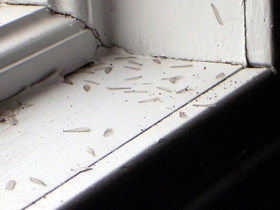 Another sign of termites are white pellets in a pile next to a door frame (living in the door frame) or pellets strewn over the floor (falling from the wooden ceiling). The wood has to be regularly treated to keep the numbers of the termites down, also because some areas are really difficult to get to. 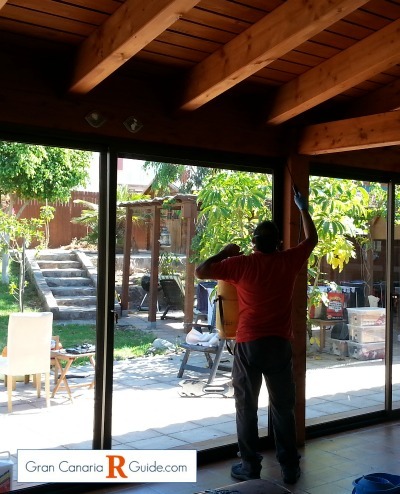 We use the Pest Control Company REDUMA, which have an effective service and competitive prices. Read here more about Reduma and their services.